The main target of the docking calculations was the recently solved structure of the CA hexameric assembly2. Four pockets of interest were selected at the surface of the hexamer in order to perform focused dockings, mainly at the CA-CA dimer interfaces. Structural variability surrounding these pockets was analyzed by comparing this X-ray structure from the PDB (4xfx, see Figure 1), and the two full capsid core models assembled by Schulten’s lab3 (3j3q and 3j3y, see Figure 2). Based on that, 36 different conformations were selected as targets for the VS, including the X-ray structure and structures from the models. Each target was set as full rigid and also with a specific combination of residue side chains defined as flexible. 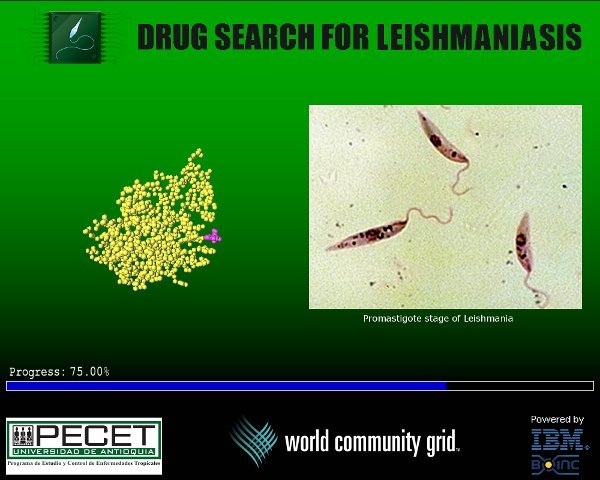 FightAIDS@Home is a project run by the Olson Laboratory that uses distributed computing to contribute your computer’s idle resources to accelerate research into new drug therapies for HIV, the virus that causes AIDS. 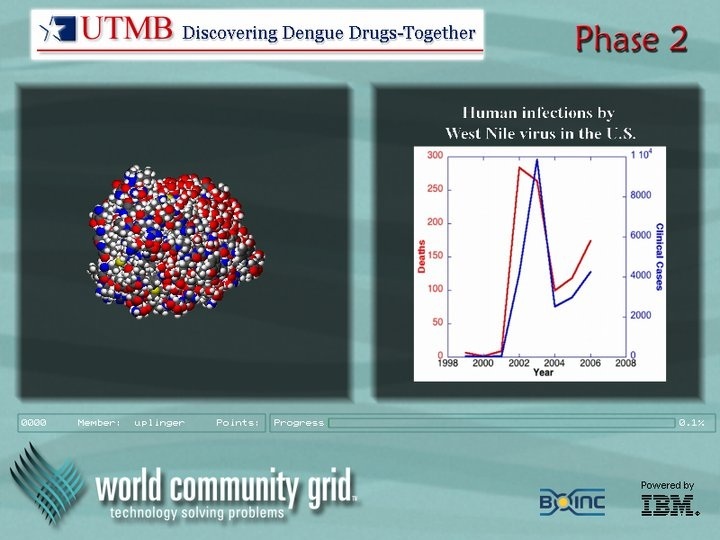 FightAIDS@Home made history in September 2000 when it became the first biomedical Internet-based grid computing project. FightAIDS@Home was started with Scott Kurowski, founder of Entropia. 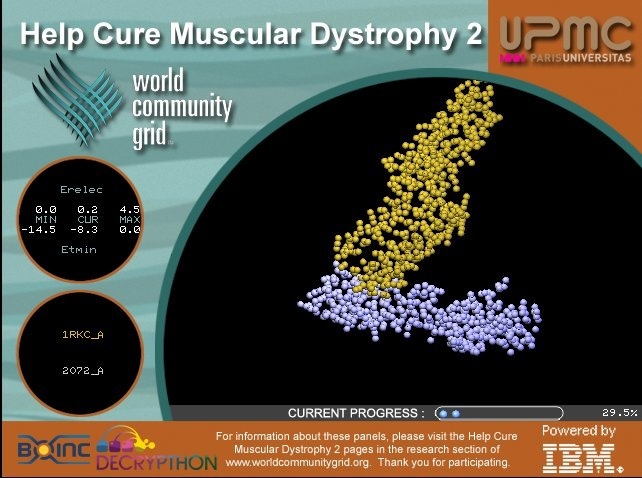 People all around the World continue to donate their home computer’s idle cycles to running our AutoDock software on HIV-1 protease inhibitor docking problems. 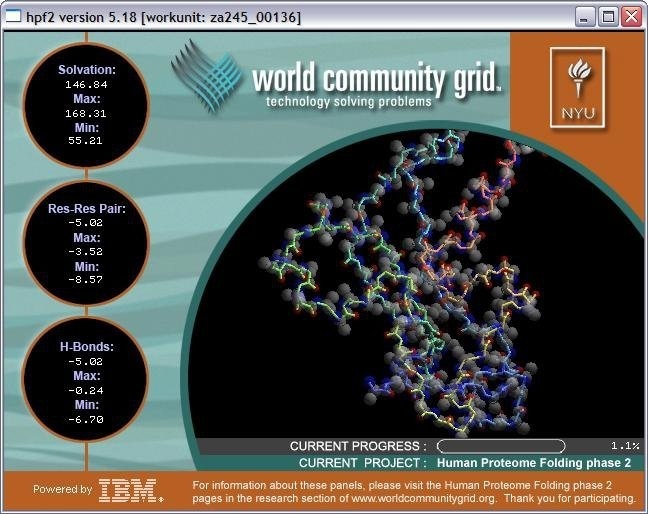 With the generous assistance of IBM, we joined World Community Grid in late 2005, and launched FightAIDS@Home on World Community Grid on 21 November, 2005. How do I join the FightAIDS@Home Project? All you need to do is download and install the free client software. Once you have done this, your computer is then automatically put to work and you can continue using your computer as usual. This webpage is dedicated to the virtual screening of the HIV-1 capsid protein in her mature form. 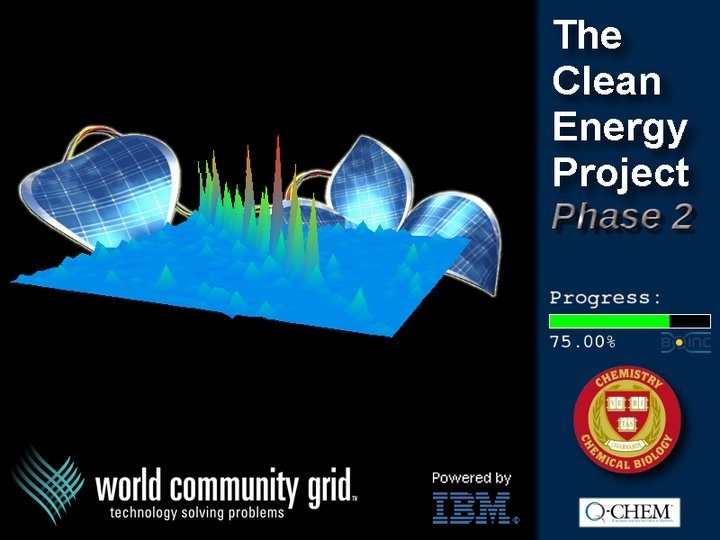 This project is part of the HIVE Center and the FA@H initiative in collaboration with IBM and their World Community Grid (WCG). 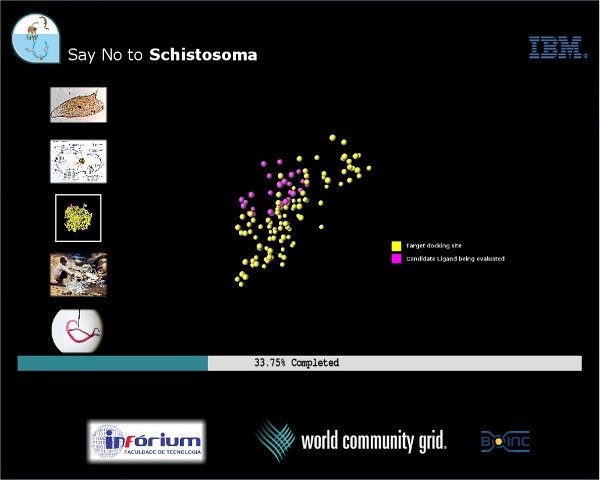 People involved in the project come from the Olson Lab in The Scripps Research Institute, and from all over the world as volunteers of the WCG. Meet them here. 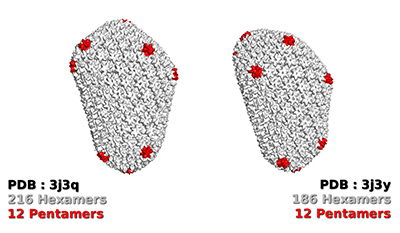 During the maturation of the HIV virus, the HIV-1 capsid protein (CA) assembles with thousands of copies to forms the capsid core [ref 1] with a characteristic conical shape (see Figure 1 and Figure 2C). This core encloses the RNA viral genome. Upon the entry of the HIV in host cells, the capsid core is released into the cytoplasm, and it dissociates in connection with the reverse transcription in a not completely understood process. This leads to the importation of DNA viral genome in the host cellâs nucleus, where it is integrated in the host DNA to finalize the infection. Figure 1: The early phase of the HIV-1 replication cycle. The critical role of CA protein, in early and late stages of the viral replication life cycle, has led to recent efforts on drug development, targeting the mature form of the protein. Currently, none of these molecules are used in clinic, and some face natural polymorphism and resistant mutations [ref 2]. Therefore, continued development of drugs targeting the CA protein is still needed. Figure 2: The HIV-1 mature capsid assembly. CA protein consist of a sequence of 231 amino acids which folds into 3 different domains (Figure 2A): The N-terminal domain (N-ter), the linker, and the C-terminal domain (C-ter). This protein chain complexes with other chains to form hexamers (Figure 2B) or pentamers; which assemble together to form the fullerene-cone shape of the capsid core (Figure 2C). There are several models of the core assembly, but all are composed of ~200 hexamers, and exactly 12 pentamers. The FightAIDS@Home team is working with World Community Grid to find active compounds which could attach to the CA proteins and mediate the assembly of the capsid core. This computational experiment will be performed using the docking software AutoDock VINA [ref 3]. Thanks to the volunteers, around 2 million molecules will be screened across ~50 conformations of the capsid protein, and hopefully lead to a reduced selection of molecules. This will be the starting point of a drug discovery process targeting the HIV-1 capsid protein. 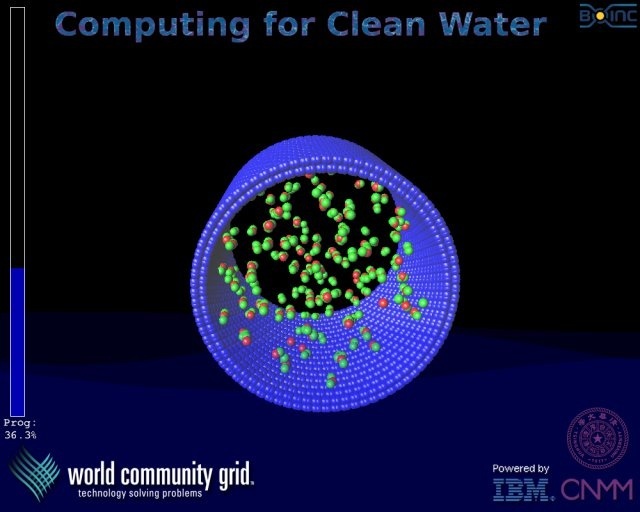 This computational experiment will be performed using the docking software AutoDock VINA [ref 3]. With the support of our collaborators from the HIV Interaction and Viral Evolution (HIVE), experimental biding assays and infectivity assays will be conducted to determine if the selected compounds could be optimized as a promising drug candidate. Figure 3: The four pockets of interest. 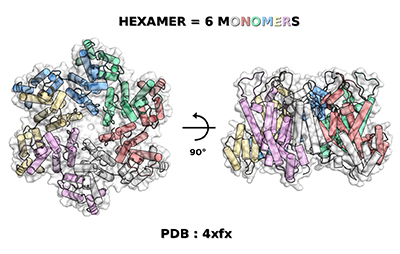 Based on X-ray structures of CA protein, models of the core, and computational analysis of their flexibility, four pockets of interest have been selected on the surface of the hexamer assembly (see Figure 3). These pockets involve either one monomer (as pocket 2 along the linker domain), at the interface of two monomers (pocket 1 & 4), or at the six-fold interface (pocket 3). Mutagenesis experiments revealed that core stability is fine-tuned to allow ordered disassembly during early stage of virus replication cycle [ref 4]. This is why selection of compounds will be done either for molecules which could stabilize or destabilize the hexamer; assuming that both actions could have impacts on the equilibrium of the core. Briggs, J. A. and H. G. Krausslich (2011). “The molecular architecture of HIV.” J Mol Biol 410(4): 491-500. Thenin-Houssier, S. and S. T. Valente (2016). “HIV-1 Capsid Inhibitors as Antiretroviral Agents.” Curr HIV Res 14(3): 270-282. Trott, O. and A. J. Olson (2010). “AutoDock Vina: improving the speed and accuracy of docking with a new scoring function, efficient optimization, and multithreading.” J Comput Chem 31(2): 455-461. Forshey, B. M., U. von Schwedler, et al. (2002). “Formation of a human immunodeficiency virus type 1 core of optimal stability is crucial for viral replication.” J Virol 76(11): 5667-5677.